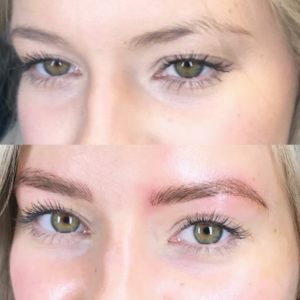 Microblading aftercare is very important to the future of your new brows! Do not let any water, lotion, soap, or makeup touch your eyebrow area during the first 7 days after you get your eyebrows done. Your technician should provide you with an after care ointment. After 5-7 days, make sure your hands are completely clean, and dry when you ever so gently apply it to your brows. You only need to do this once a day (probably best at night when your face isn’t exposed to the outside air). Make sure to use sparingly; your skin needs to heal! Continue to use the ointment for 7 days. Drinking alcohol will slow down the healing process- its only two weeks, you can do it!!! Itching and flaking will probably happen during the first weekdays post-microblading procedure. don’t freak out. We created a chart for you with all the emotional stages of microblading. You can download it here. If you have any unexpected problems with your brows/skin healing. Please contact Petals Laser Lounge ASAP. 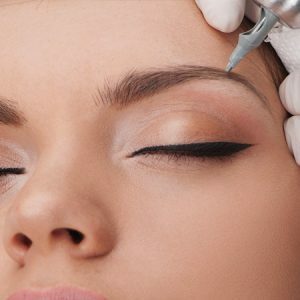 The pigment will appear very natural looking immediately after the procedure. The color of the pigment will appear much darker the next day. Don’t. freak out. SUPER IMPORTANT!! – Because of the natural regeneration of your skin and peeling, your brows might appear lighter than when they first got bladed. Even with proper care, clients sometimes lose original blade hairstrokes which might make brows look a bit uneven. THIS IS NORMAL. Most clients come back in 6 weeks for a touch up. You’re all good. When the healing process starts, the eyebrow area will look like some dandruff is coming off (ugh, ew). But! the final look of your eyebrows will be visible about a month after your procedue. Never rub the area!! It’ll disturb the skin from natural healing!! 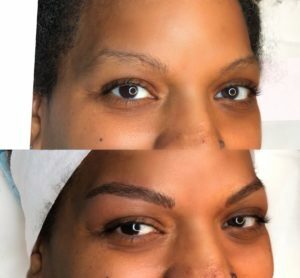 You can get more info about getting your brows bladed to perfection in NYC at Petals Laser Lounge in person, online, or by phone at 212-363-5555. Please see our full menu for pricing.